The internet is filled with convenient and user friendly interactions that encourage you to spend money: one-click purchasing, recommendation engines, wish-lists, registries, SMS purchasing, etc. 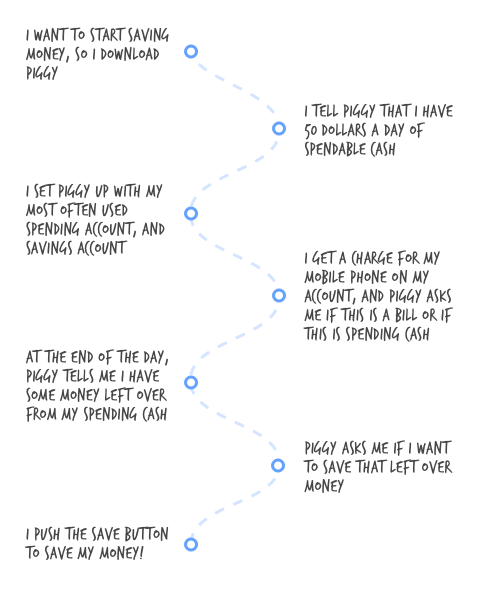 There are loads of buttons that help you spend money. However, there are very few buttons to help you save. 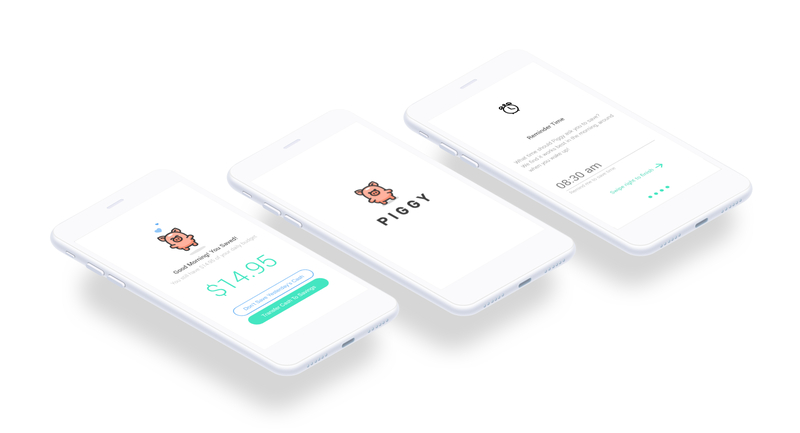 Piggy brings the save button to the forefront, and helps people develop better money-saving habits one day at a time. A friend and I got into a discussion about how difficult it is to save money. Our conversation shifted to complaining about how our culture is a spending culture, and we are pushed to spend but not to save. In our personal lives spending occurs daily, while saving occurs bi-weekly or monthly. We are very good at spending because we practice it daily, but the opposite is true of saving. As a result, the act of spending feels easy and seamless, while saving money feels like a chore and takes effort. Moreover, we both didn't have confidence in our ability to save. We felt that our spending habits were bad. We recalled that when we did have extra cash, we usually ended up spending it on socializing or superfluous things. I want to save money, but my current saving habits and lack of extra cash make it very difficult to save money. Our next step was to do some customer discovery and see if other shared in this pain. Before we started to dig into solutions, we wanted to see if other people had a similar relationship with money and/or related to our problem statement. We created a short list of questions to ask people. We started with gathering qualitative data from 5 in-person interviews. Most people desired to save more money. Most people spend money every day. Most people did have spendable income. Half of the people said they did not have good saving habits. Some people said they didn't budget. Few people said they spend "too much". Few people said they are often encouraged by others to save money. We thought these responses validated that people wanted to save money, but their saving habits were bad. However, we feel that our assumption that the lack of extra cash led added to the difficulty of saving was invalidated. We observed from multiple in-person interviews that extra cash wasn't viewed as money they should save, rather there was a perception that the extra cash could be spent. I have extra money that I want to save, but I have bad saving habits. At this point we felt confident that people resonated with our problem statment, and decided it was time for an abbreviated design sprint. Almost right away we had an interesting finding. While getting background and looking at our competition, we noticed that most existing tools were directed at helping people get context around their money. They "helped" people save by offering up budgets or attempting to automate the saving process. Looking at our competition was eye opening. It didn't seem that anyone had acitvely focused on developing a persons saving habit. Rather, existing tools aimed to help people save money by monitoring spending habits. We kept this top of mind as we went though the sprint. People's saving habits will be improved if we engage them in saving daily. Providing a person with daily encouragement and reminders to save their left over spending cash will help develop better saving habits. As we refined a potential solution, we surfaced many assumptions about our users that we needed to test. People will use one account for all daily spending. People want to be reminded to save money daily. People want the option to save. People will save out of spending cash, and that is separate than bills. Next we set out to build a prototype to test with users. We ran 7 user tests with our "target market"; people who made $80K+, currently wanted to save money, and felt that they had bad saving habits. We weren't entirely confident that this was our target market, but that was the group we had gotten the most positive feedback from. The user tests were a great success. Not only did we uncover some (now seemingly obvious) interface and experience problems, but we got a lot of positive feedback and validation that being prompted to save money felt empowering, and that it felt different from other tools. About half of the group users asked to be notified when the application was to be released without being prompted. Before we started to develop the MVP Piggy application, we spiked on the engineering side of things. We quickly ran into some difficult technical hurdles. The immediate problem we faced was facilitating the transferring of funds from a checking account to a savings account. We were able to find a means to do so, but at a high cost. The best solution we found would cost each user $10 per month. Don't have a save button, rather remind and suggest an amount save. Partner with a bank to get free access to the API to facilitate money transfers free of charge. Find a better/free solution to facilitate money transferring. Create a better/free solution to facilitate money transferring. To date, we are currently pursuing the third option, while considering the first option to be our MPV. We felt that although you couldn't save money using the application, the daily reminders and encouragement would still be usefull. Our end goal is to provide the means to directly save money without any charge to the customer, so option 5 is out of the picture for now. We were able to negotiate the use of an API for up to 10 accounts for free. Although this isn't ideal or for that matter a scalable solution, we felt it was a positive step in the right direction and would allow us to work with some early adopters. Gem for easy blogging in a rails app. Validate product ideas without spending money.